*Whew* Boy! What a week! I lost 0.1%, while SPY lost 1.8%. Basically, I lost 1½ weeks’ profit, while SPY lost 2½ weeks. Monday: President’s Day. US markets closed. Canadian markets also closed, for Family Day. Tuesday: My emergency stops worked! Losses for the day were capped at 1.3%, which happened to be the same as SPY’s loss. I sold ¼ CAT at the open, then the final quarter was stopped out. I sold ½ MMS at the open—it was the only sell-stop that didn't trigger, so I still have the other half. Some settled cash came in, so I bought CXO (energy), PIKE (energy construction) and PROV (microcap bank) because they didn’t drop when all the other stocks did. Wednesday: By the time I got up in the morning, it was too late to place a 4% stop on PIKE, which had already dropped 6.1% since the open! So I gave it a 10% stop and hoped. Later it rose to -5.9% for the day. CXO rose nicely but PROV fell and they cancelled out. PIKE is about 10% of the account so its 6% loss made me lose 0.6% overall for the day. Still, SPY did even worse and lost another 1.3% for the day. Thursday: PIKE recovered half its loss. PROV fell a little more and got stopped out. I had money to invest, but nothing looked good, so I bought more CXO at 1:30pm which is usually its low point of the day. But today that was the high! CXO ended its day where it had begun. DRETF came out with its annual report, which was very good but apparently not good enough, so the stock dropped its recent gains. I lost 0.3% for the day, while SPY held to neutral. Friday: CXO rose, and it is ⅓ of my entire account! 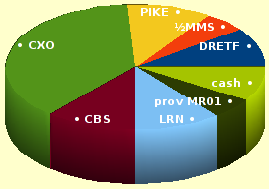 PIKE and MMS rose a bit, while DRETF recovered its losses for the week. New purchase LRN rose nicely. New star CBS rose 5% on its first day! I’ve put in an order to sell half of it on Monday. Overall I gained 2% for the day, while SPY gained only 1%. Part of the problem with DRETF is that I was checking the daily-close values too early. As a non-listed security, its trading day doesn’t end until 6:30pm. 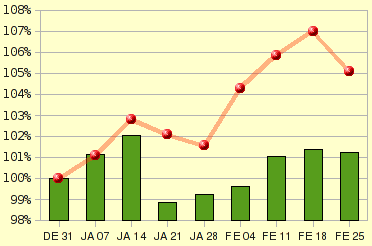 So I got Schwab’s “Active Trader” thing (which was previously StreetSmart.com). It’s got good points and bad points. It does offer trade-stops, but only as “conditional alerts” which are treated separately from trades (when the alert fires, it creates a trade order). Schwab recommends that trade-stops be used only for NYSE or AMEX stocks, as they are unreliable for NASDAQ or PINK. Every time you log in, it laboriously lists each active conditional alert in a popup window. Clearly, they don’t want you to use too many! Judging from all the alerts they put up, it seems the two things Schwab is afraid of are that you will ask them to reverse a trade “because I didn’t intend to do that!” or that you will walk away in a snit because your stops sold for much less than their trigger prices. The “bracket” orders work well. You can enter a sell-stop at the same time as the initial purchase, even though you don’t have the shares yet. (Too bad they always trigger on bid prices.) You can enter a sell-limit and a sell-stop on the same shares, which I’m using to sell ½ of CXO and LRN if they go up a little more. In the plain system, multiple orders for the same shares are rejected; in the active-trader system, you get a warning that the stop will sell a reduced number of shares if the limit triggers first. Why yes, that *is* what I meant! New rule: When the market drops a lot, don’t buy anything the next day. I made this same mistake in both of the last two corrections. Insteading of buying something that didn’t drop when everything else did, wait another day and buy things that didn’t drop either on the Big Day or the day after. This would avoid problems like PIKE that didn’t drop *yet* by Tuesday’s close but then reality caught up with it on Wednesday. For Monday: pick another stock to buy, to use up the cash and the PROV money that will come in on Tuesday.